Grilled Swordfish with Summer Vegetable Crab Salsa is a 20-minute dinner wonder. 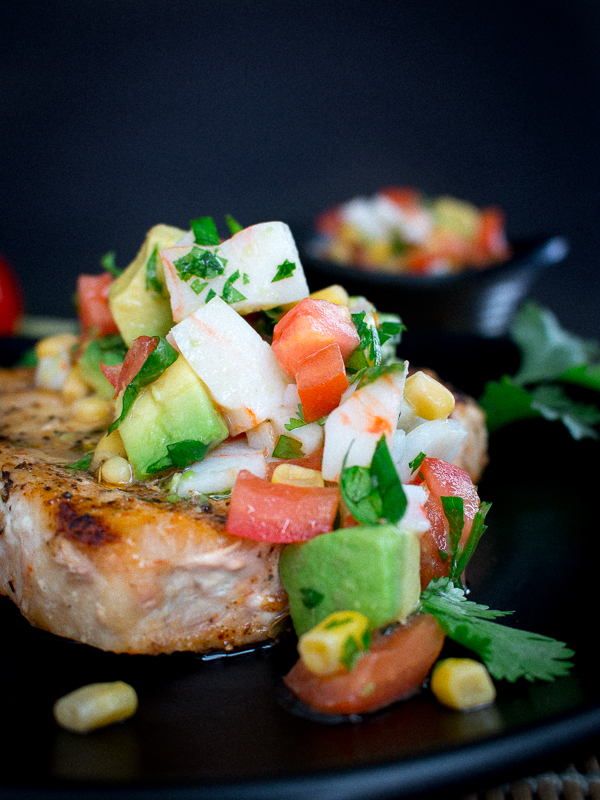 Succulent Cajun spiced swordfish steaks and topped with a zippy crab, avocado, corn and tomato salsa. 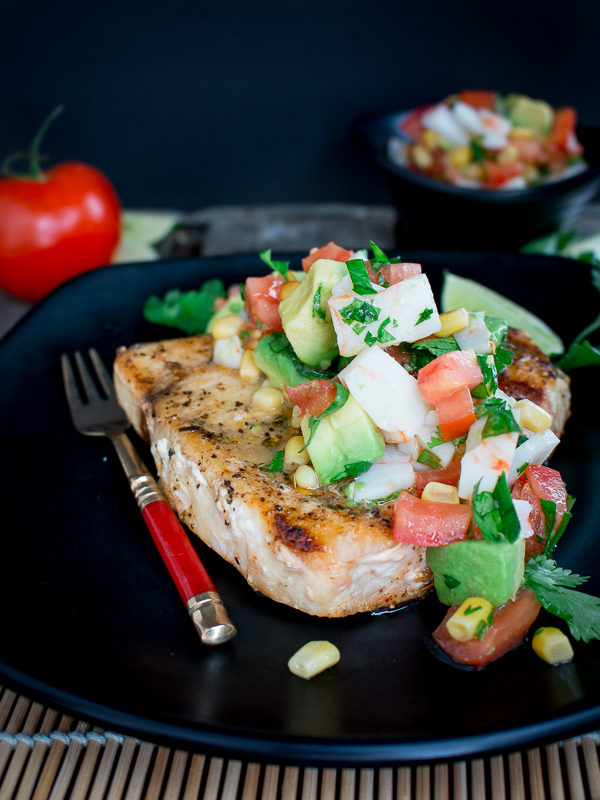 You are just going to love this Grilled Swordfish with Summer Vegetable Crab Salsa as it is gluten-free, dairy-free and super EASY Peasy to throw together. Grilled Swordfish with Summer Vegetable Crab Salsa is easy enough for a week night meal and fancy enough for guests. Even your fish haters in the group will love this one as swordfish is a meaty steaky textured fish and topped with Cajun spices makes it extra delicious. 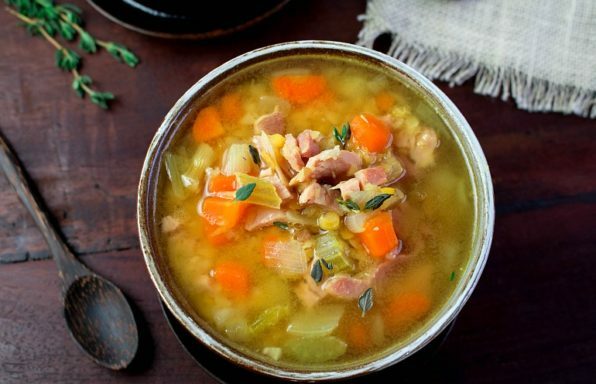 We used an already prepared Cajun Seasoning mix but you can also make your homemade from the spices you have on hand. We love Kevin is Cooking Creole Seasoning Spice Blend . 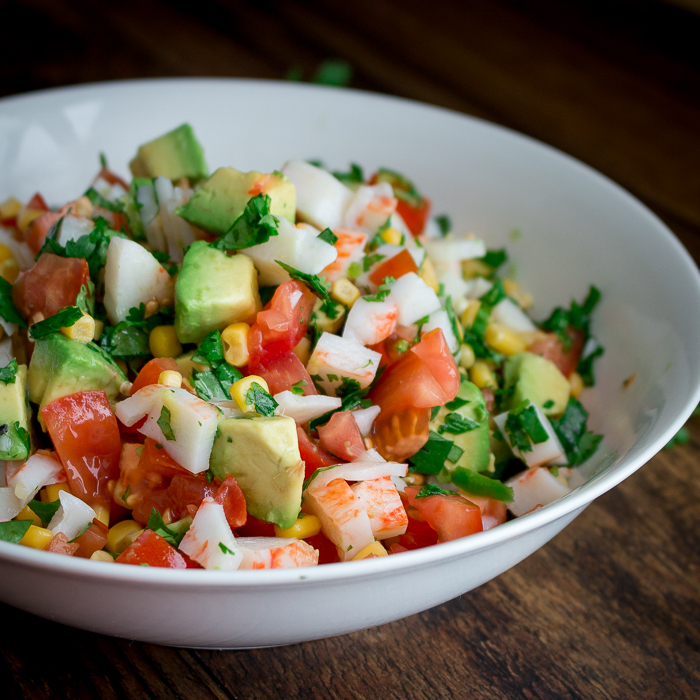 We could eat the summer vegetable crab salsa all by itself it is so good and as a matter of fact we did the next day for lunch. Delicious wrapped up in a lettuce wrap, by the way. 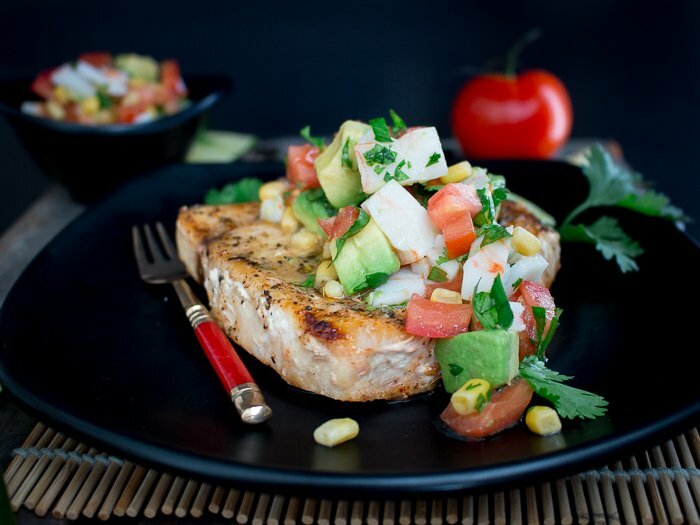 If you want to make your Grilled Swordfish with Summer Vegetable Crab Salsa low carb/keto friendly just hold the corn or exchange with a low carb vegetable like a bell pepper instead. It is summer and we are enjoying the farmer’s market golden sweet corn and vine ripened tomatoes. You can even grill your corn before you place it in your salsa if you want to get all fancy and add extra flavor. However, we were on a time limit and getting dinner on the table in under 20 minutes and a photo shoot was all we could muster on this warm summer’s day. 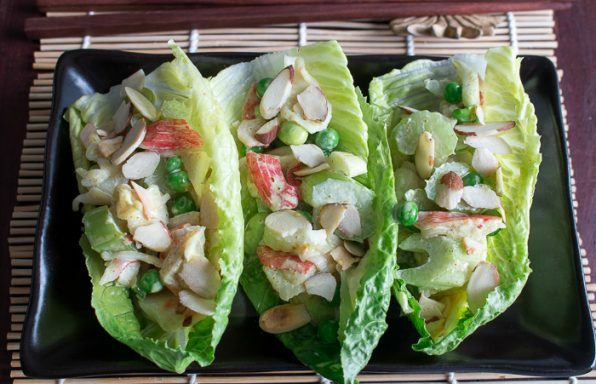 We used gluten-free imitation crab as we were going for simple and easy but it is also EXTRA delicious with hand-picked over fresh crab or even canned crab. 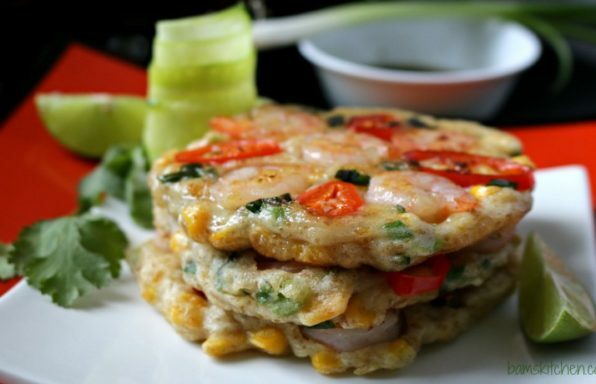 Crab meat is cooling so make sure you add some jalapenos to balance to heat and the cooling. Do you enjoy grilling out? We do too but we are fair weather grillers. Personally, we do not do well jostling a golf umbrella, grilling tongs and a cocktail and your dinner too. 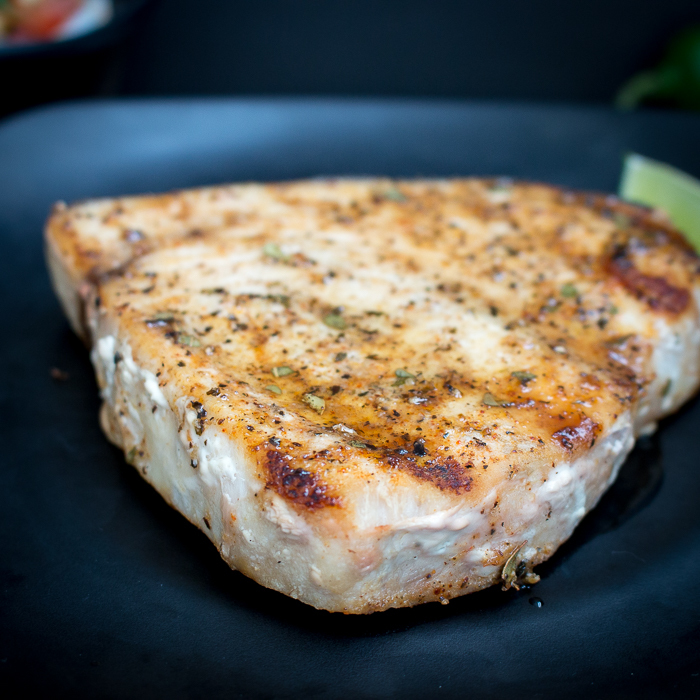 If Mother Nature dampens your plans, feel free to use the indoor grill pan or just saute your swordfish steak instead. Both options are delicious. We hope you are enjoying this grilling weather. 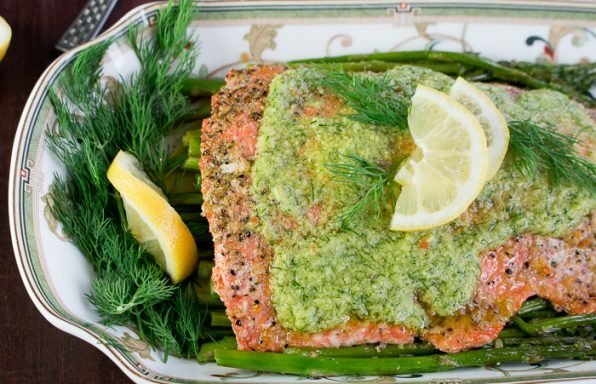 Please check out our Summer Grilling and Chilling Recipes for more inspiration. We made a side of our Grilled Chili Lime Okra on the side and dinner was served. . For Dessert we enjoyed our Cherry Plum Fruit Crumble . 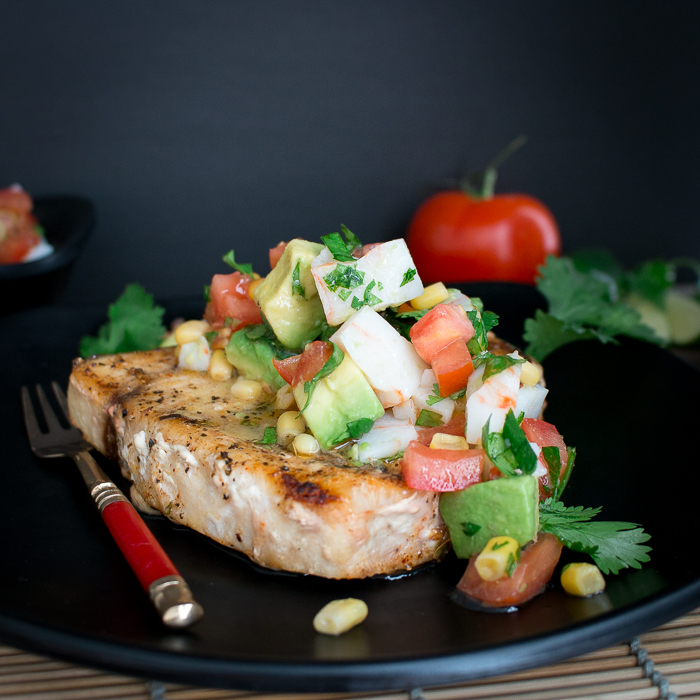 You need to get this delectable Grilled Swordfish with Summer Vegetable Crab Salsa on your meal plan soon. 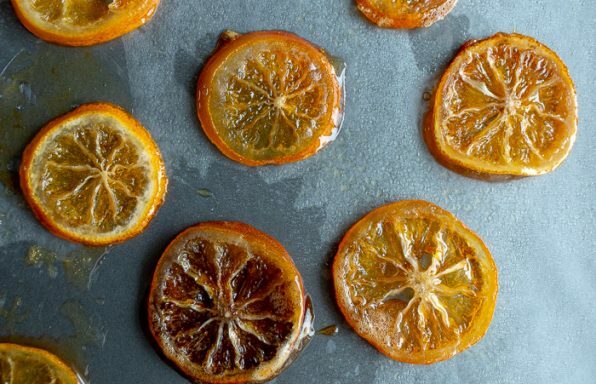 1Prepare and heat up your grill. Drizzle olive oil, and Cajun seasoning on both sides of the swordfish. 2Place your Swordfish on the grill and grill on both sides for about 3 minutes or until the fish flakes and is no longer translucent. 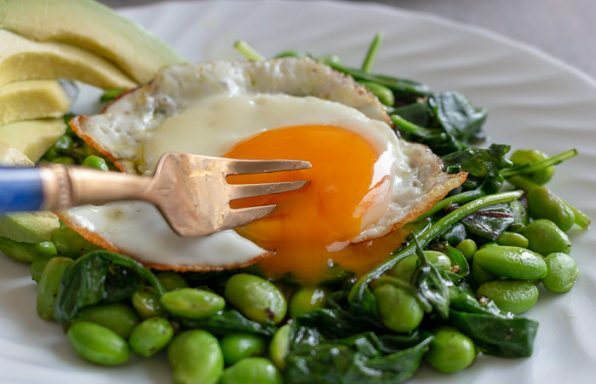 (If you wish to get grill marks on your corn on the cob for the salsa, please place corn on the grill now) If Mother Nature is not cooperating, you can grill your swordfish on the indoor grill pan or even saute your swordfish in a pan on top of the stove. 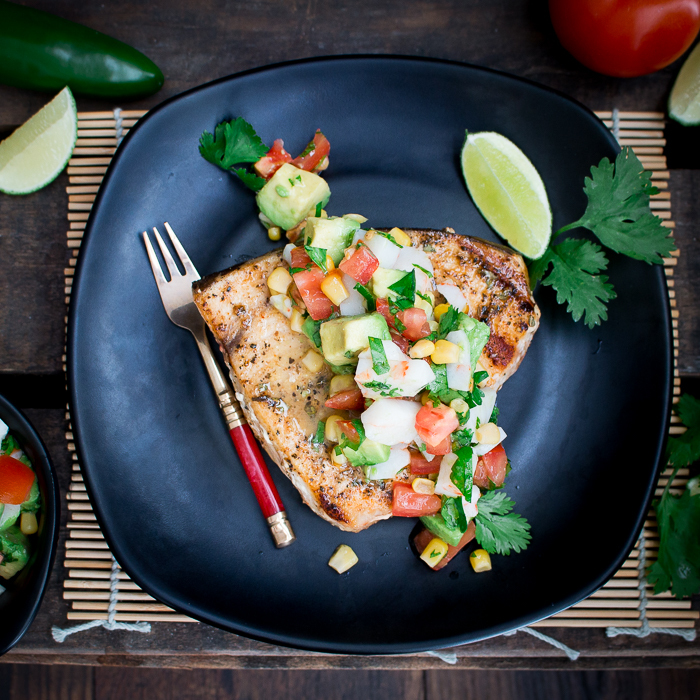 3While your swordfish is grilling, add your crab, avocado, lime juice, garlic, jalapeno, corn, cilantro, tomatoes and salt and pepper to a bowl and toss well. 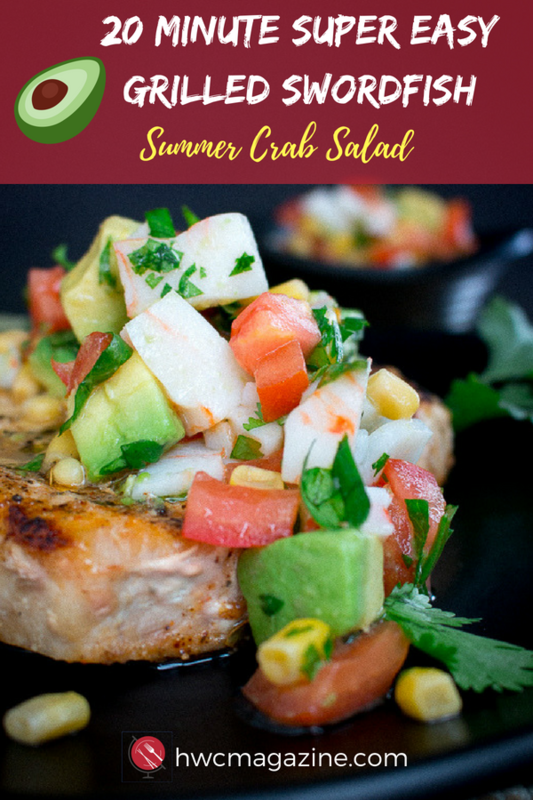 4Remove your swordfish steaks from the grill and top with some of your beautiful summer vegetable crab salsa and squeeze a little lime juice over and enjoy!